Want to Understand & Master the Bulgarian Dialogue 100%? Jonathan: Hello and welcome to the Absolute Beginner series at BulgarianPod101.com. This is season 1, lesson 1, First Encounters in Bulgarian. I’m Jonathan. Jonathan: Together we will guide you through the first steps in Bulgarian. Iva: That’s right. So get ready and … enjoy! Jonathan: Yes, because it is fun to learn Bulgarian. Iva: And we’re here to make your absolute beginner experience easy and productive! Okay, Jonathan, what do we have first? Jonathan: In this lesson you'll learn how to say "hello" in Bulgarian in the daytime. Iva: This conversation takes place on the street. Jonathan: The conversation is between two people. Iva: The speakers know each other but their relationship is formal, so they’ll be speaking formal Bulgarian. Jonathan: Let’s listen to the conversation. Jonathan: And Now with the English translation. Jonathan: OK, so now it is time for some more information about Bulgarian culture. Iva: Yes. 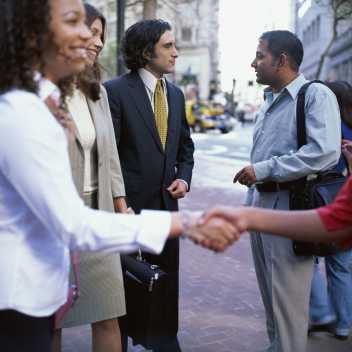 Bulgarians like to greet each other on the street when they are close acquaintances or friends. Jonathan: It is also a very typical thing to see in the countryside, right Iva? Iva: Yep! People would stop by to talk to their friends and ask them how they feel, or just to say politely hello and have short conversation. Jonathan: So what would you say in this situation? Iva: In this case we usually use the expression “Как сте?/Как си?”. Jonathan: Remember that when talking to elderly people, it is considered polite to use the second person plural form of the phrase. Iva: ...and other phrases like “Добър ден” and “благодаря” instead of their informal versions “Здравей/Здрасти” and “мерси”. Jonathan: In our formal situation the speakers use the second person plural to express their respect for each other. Okay, now onto the vocab. Jonathan: Let’s take a closer look at some of the words and phrases from this lesson. Iva: Yes, in addition to their meaning, we will explain some information about their forms and usage. Jonathan: This is one of the most important phrases in Bulgarian. Iva: Yes, you will hear this every day. Jonathan: It can be used both with people you know or people you are meeting for the first time. Iva: Literally it means "Good day" so that’s why it’s used in the daytime. Iva: But for now, just remember “Добър ден”. Jonathan: It’s the most common way to greet people in Bulgaria. What’s next, Iva? Iva: “Добре съм” which means “I am fine” or "I am well". Jonathan: This phrase naturally follows the question “How are you” in Bulgarian. Iva: In Bulgarian, “how are you” is “Как сте?” for the formal and “Как си?” for the informal question. Как сте? for formal and Как си? for informal. Jonathan: Ok, so make sure you listen out for this question! Can you tell us more about the phrase “I am fine”? Iva: The adverb "добре" means “fine”, “well”, “OK” and sometimes can be the only answer to the question “How are you?”. Jonathan: So how does that sound? Jonathan: It can be used among friends, right? Iva: Yes, it can be used in conversation as an affirmative “OK”, like in English. Iva: “Благодаря” meaning “thank you”. Jonathan: Another very useful Bulgarian word! Iva: Indeed, do not forget to use it often. Jonathan: Yes, it will help you in so many ways. Jonathan: And this one is mostly used in formal speech but can be used in the informal too. Iva: That’s right. Its informal substitute is “Мерси”. Jonathan: Oh, that sounds familiar! Iva: I know, but we are going to talk about it in detail in our next lesson! Jonathan: Ok, let’s move on to the grammar! Jonathan: The focus of this lesson is how to greet people in the daytime in Bulgaria. Iva: And ask them how they are feeling. Jonathan: "How are you" or "How you are feeling"? There are several phrases used to ask how someone is feeling in Bulgarian, just as in English. Iva: But let's just focus on the usage of “Как сте” in this lesson. Jonathan: Okay, (name). Give us an example. Jonathan: How are you today? Iva: And it is formal. Jonathan: Because the verb is in its polite form. Jonathan: Means “How are you, dear?” There's no difference in the meaning of the phrase. Just remember that the verb changes its form from “сте” to “си”. Iva: The first one “сте” is the second person plural and the second one, “си” is the second person singular of the auxiliary verb. Jonathan: OK. Here's a question for you. If you were visiting a friend in the hospital after he’d had an accident, what would you say? Iva: I hope I won’t have to ask any of my friends this question though! Jonathan: OK, OK, sorry! Next you'll learn how to ask how someone is (feeling) in a formal situation. Let’s say you are asking Mr. Petrov. Iva: That will be “Как сте, господин Петров?” It is formed using a phrase you already know plus the name of the person. Jonathan: It means “How are you, Mr. Petrov?” right? Iva: Yes, Petrov is one of the common family names in Bulgarian. Jonathan: So what is the usual way to reply to this question? Jonathan: Can you just mention some of them? Jonathan: In that case the verb can be omitted. Jonathan: Let's recap this lesson. You want ask someone “How he/she is?” What would you say? Iva: If he or she is your friend? Jonathan: And how about if this is your boss, for example. Jonathan: OK. That's all for this lesson. In the lesson notes, you can find more details about this expression. So be sure to read them. Iva: Yes, please! OK, see you next time! How are you doing today? Could you answer the question in Bulgarian? thank you for posting. Unfortunately, I cannot get exactly your sentence. днес гаранциа как е едно музикален инструмент. съм is 1st person singular form of the verb "to be". Аз means "I", so Аз съм is "I am". As the verb in Bulgarian changes in person and number, you can usually skip the personal pronoun and still convey the right meaning. It is a bit tricky with the 1st person singular as it sounds weird sometimes, but it is quite ok to say "Добре съм." (I) am fine. "Аз съм ученик" means "I am a student"
"a" in "a student" is a peculiarity of the English language and does not have an equivalent in Bulgarian. съм means I'm and ученик means student so in your example "Аз съм ученик" contribution of Аз is a? Hi! I'm ready to start learning Bulgarian. It's easier for me since I'm Polish and some words are very similar, although, i'm still sp hyped! Thanks for creating this site! "Добре " ebben az esetben valószínűleg nem " finom, hanem jó/ jól.